A Picture Is Worth a . . . The photo to the right is a picture that speaks of intricate design. 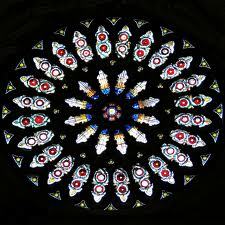 It is a picture of the famous Rose Window in the York Minister Cathedral in England. The window was designed to celebrate the marriage of King Henry 7th and Elizabeth of York. This marriage finally brought an end to the ‘Wars of the Roses’ that had divided British feudal nobility between the years of 1450 and 1485. This marriage joined the House of Lancaster to the House of York and brought peace to the two families and eventually gave birth to Henry 8th. The picture to the left is equal in beauty to the top photo, and it also speaks of complex design. The curious thing about these two pictures is that when people see the Rose Window they stare at its beauty and ask questions that focus on the person who designed the window. When people look at the picture to the left, some are perplexed to learn that it is a vertical cross-section of human DNA: The human race that some say is the product of chance. Would you believe that the Rose Window and the York Minister Cathedral just spontaneously appeared without a designer? I doubt it. 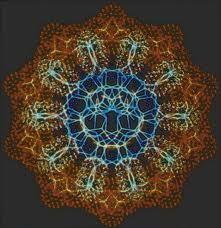 How, then, can a person say that the human race with 3.1 billion bits of information in the DNA was not designed? I believe this is a case where a picture really is worth a thousand words. An inflection point can be defined as a moment of dramatic change, especially in the development of a company, industry, or market (American Heritage Dictionary). Wall Street defines an inflection point as a point on a chart that marks the beginning of a significant move either up or down. Due to the stress and strain of the moment, inflection points can be hard to recognize in the present; and, they are more easily seen from the perspective of history. A significant inflection point in the Old Testament involves the Hebrew nation and its long awaited and highly anticipated move into the Promised Land. Instead of crossing into the land of milk and honey, they chose to hunker down in a dust-choking, water deprived wilderness. The dramatic change in the life of this fledgling nation occurred when they listened to the report of 12 spies when they returned from a secretive mission. The majority report was given by 10 spies: There are giants in the land, and we look like grasshoppers in their sight. The minority report was given by Joshua and Caleb, and they spoke of the vast resources of the Promised Land, and said, let’s claim the promise. Their decision changed the course of history. They acted on the minority report and instead of going up and forward, they went down and back. As a result of believing the minimalist view, every one of the 12 spies died . . . everyone except 2 of them: Joshua and Caleb lived and continued to play an influential role in birthing a new nation. The older generation continued in their resistance and died in the wilderness, but Joshua and Caleb continued in their persistence. Even though their bodies aged, their faith was renewed each morning as step by step they moved forward to possess the promise of God. When Andrew met Jesus, he found his brother Peter and took him to Jesus. This inflection point led to dramatic changes in the lives of many people. When David decided to leave the battle to his soldiers to peek into the private life of Bathsheba, he changed the course of many lives. Innocent people died and others suffered consequences that were not of their own making. Paul’s sad epitaph in regard to Demas is haunting words: Demas has forsaken me, loving the present world more than the one to come. What decision led to this dramatic change? When faced with a crisis or a major decision, I encourage you to listen to the counsel of Solomon: There is wisdom in a multitude of counselors. When you meet an inflection point, ask yourself a couple of questions:  What will Mother or Grandmother think of my behavior when they hear of this? What will happen when my actions make the front page of the newspaper and my picture is on the evening news? What is the source of your strength and what principles of truth guide you when your life intersects with an inflection point? I hope this is enough to keep you thinking. There has been a story in the news the last week or so about some new finding that said Jesus had a wife. I’ve been asked about my thoughts on this matter. In the sense of this new discovery, it has been proved to be bogus, and the story has been proven to be of no value. There is proof, however, that Jesus does have a bride, and she is one heaven of a woman! The New Testament refers to the Church as the Bride of Christ, and Paul wrote that Jesus loved her and gave Himself for her (Ephesians 5:25-27). Whenever you hear a sensationalized story in the news that attacks the integrity of the Scriptures, don’t swallow it hook, line, and sinker. Take a step back so you can evaluate the claims and check the sources. Since Jesus is the Groom and the Church is the Bride, I have to ask a question: Are you ready for the wedding?